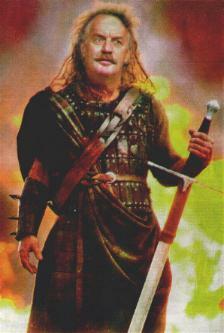 Celtic director Dermot Desmond as he might look as Scots hero William Wallace in the movie Braveheart. He bought the broadsword, which was donated by actor Mel Gibson, at a charity auction. The five-foot broadsword wielded by Mel Gibson in Braveheart has been bought by Dermot Desmond, Celtics biggest single shareholder, for �6,000. But Mr Desmond, the director of the Parkhead clubs board, did not explain why he bought it. A spokeswoman at his Dublin office said he was "not interested in talking to the papers about stuff". Gibson donated it to an African Aids project being undertaken by UNICEF Ireland. The sword, one of several used by Gibson as William Wallace in the Oscar-winning film, was the top lot of Hollywood memorabilia at a charity auction in New York. The light sabre Liam Neeson used when he played Qui-Gon Jinn in the Star Wars prequel The Phantom Menace was bought by the millionaire businessmans son Ross for �,000. The sale, hosted by Neeson himself, made almost �7,000. A total of 15 lots donated by stars and studios went under the hammer. Neeson, who was at the sale with his wife Natasha Richardson, said he was delighted at the price fetched by the Braveheart sword. "It was a fantastic price. Mel is a friend of mine and he knew it would fetch a high price." He added: "I have never been in this sort of situation before but I am told this is very, very high for an auction of this type. It is hard to sit through all this without getting a knot in your stomach." Julia Roberts, an Oscar front- runner this year for Erin Brockovich, donated the wedding gown she wore in Runaway Bride. It went for �,000. The dress worn by Catherine Zeta Jones in the Mask of Zorro, in which she played opposite fellow Welsh actor Anthony Hopkins, went for just over �00, while a shirt worn by Ralph Fiennes in The English Patient fetched �00. Also under the hammer were the whip from the Indiana Jones movies, which went for �,000 to an anonymous telephone bidder, and a copy of the music to the forthcoming Harry Potter movie, which fetched �00. Other highlights included a Faberge-framed Cecil Beaton photograph of the late actress Audrey Hepburn, who also worked for UNICEF. It sold for �,000. A deck chair from the film Titanic went for just over �00. A birthday phone call to the successful bidder from pop star Michael Jackson was the evenings lowest draw at only �0. Neeson said he and others spent more than a year placing thousands of calls and sending letters to Hollywood stars seeking donated items from their films. The proceeds will be used to provide drugs to prevent mother-to-foetus transmissions of Aids in African countries. "We cannot take for granted the health of our children," said Neeson, citing "disgustingly huge" rates of infection. He added that it cost only �to provide the treatment necessary to stem mother-to-child transmission of HIV, the virus that causes Aids, which has reached epidemic proportions in Africa.